With a little over a week to go, IBM Connect 2017 looks set to be as busy as ever. 2016 was a challenging year as a Domino developer, testing the faith and patience of many. My attendance at IBM Connect as a speaker, Business Partner and IBM Champion may seem “business as usual”, but it has not been a straightforward journey. So I hope the experience is as positive as last year but with a more positive rest of the year. On Monday I will be taking part in and leading a team for the IBM Connect Hackathon. I’m looking forward to working with my team, educating them on some aspects of Domino OSGi and Watson Workspace development, but also learning from them on other aspects. I’m looking at this as an opportunity to build and test more traditional app dev skills. Occasionally a message makes you sit up and take notice. So when Stephan Wissel told the ODA development team that he was looking to use the API in Verse On Premises, it was a big deal. Those of us who have been using it know the benefit, not just for streamlining our code but also for adding power. I’ve unsuccessfully submitted sessions on ODA for a number of years to IBM Connect, so it’s great to present this session on Wednesday 2:00 – 2:45 in Room 2020. It’s even better that there are two other sessions covering aspects of ODA, just a shame that they’re at the same time: “Big Data with Graph, IBM Domino and OpenNTF API” in Room 2020, and “BlueMix and Domino – Complementing SmartCloud” in Room 2008, both on Thursday 10:00 – 10:45. No doubt there will be a lot of other activities I’ll be involved in outside those sessions. I hope there is plenty of news that engages the blogger in me. 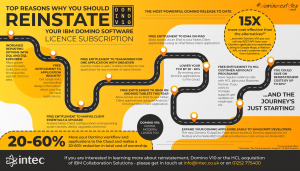 what questions are you going to ask IBM regarding Domino? A lot will depend on what’s announced in the OGS and other sessions. What is key is a good feature-set beyond FP9. I hope there will also be announcements about aspects I discussed with IBMers last year.